We all learn in high school science about the dual nature of light -- that it exists as both waves and quantum particles called photons. It is this duality of light that enables the coherent transport of photons in lasers. Sound at the atomic-scale has the same dual nature, existing as both waves and quasi-particles known as phonons. Does this duality allow for phonon-based lasers? Some theorists say yes, but the point has been argued for years. Recently a large collaboration, in which Berkeley Lab scientists played a prominent role, provided the first "unambiguous demonstration" of the coherent transport of phonons. Ramamoorthy Ramesh, a senior scientist with Berkeley Lab's Materials Sciences Division, was a co-leader with Arun Majumdar, a former Associated Laboratory director at Berkeley Lab and currently VP for Energy at Google, of an experiment in which phonons underwent particle-to-wave crossovers in superlattices of perovskite oxides. "Our observations open up new opportunities for studying the wave-like nature of phonons, particularly phonon interference effects," says Ramesh. "Such research should have potential applications in thermoelectrics and thermal management, and in the long run could help the development of phonon lasers." Unlike elementary particles such as electrons and photons, whose wave nature and coherent properties are well-established, experimental demonstration of coherent wave-like properties of phonons has been limited. This is because phonons are not true particles, but the collective vibrations of atoms in a crystal lattice that can be quantized as if they were particles. However, understanding the coherent wave nature of phonons is of fundamental importance to thermoelectrics, materials that can convert heat into electricity, or electricity into heat, which represent a potentially huge source of clean, green energy. "Lower thermal conductivity is one of the keys to improving the efficiency of thermoelectric materials and the key to thermal conductivity in semiconductors is phonon transport," Majumdar says. "Nanostructures such as superlattices are the ideal model systems for the study of phonon transport, particularly the wave-particle crossover, because the wavelength of the most relevant phonons are in the range of one to 10 nanometers." Superlattices are artificial periodic structures consisting of two dissimilar semiconductors in alternating layers a few nanometers thick. For this demonstration, the collaboration synthesized high-quality superlattices of electrically insulating perovskite oxides on various single-crystal oxide substrates. 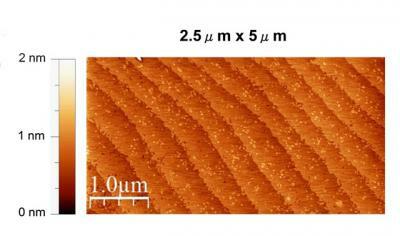 Interface densities in these superlattices were systematically varied using two different epitaxial growth techniques. Thermal conductivity was measured as a function of interface density. "Our results were in general agreement with theoretical predictions of crossover from incoherent particle-like to coherent wave-like phonon transport," Ramesh says. "We also found sufficient evidence to eliminate extraneous or spurious effects, which could have alternatively explained the observed thermal conductivity minimum in these superlattices." Capitalizing on the wave behavior of phonons should enable new advances in new heat transfer applications, the collaborators say. 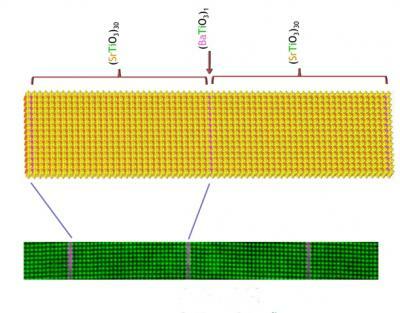 Furthermore, perovskite superlattice-based heterostructures could also serve as basic building blocks for the development of lasers in which beams of coherent phonons rather than coherent photons are emitted. Phonon lasers could provide advanced ultrasound imaging or highly accurate measuring devices, among other possibilities. Ramesh is a corresponding author of a Nature Materials paper describing this research titled "Crossover from incoherent to coherent phonon scattering in epitaxial oxide superlattices."